SANTIAGO, Chile (CNS) — In a wealthy area of Santiago, Maria Jose Griffin and her husband, Juan Carlos Cornejo, were in their spacious sitting room, preparing Christmas dinner for three families they have never met. Griffin and Cornejo had three boxes, each covered with a Nativity scene and labeled with the family’s name, so they could feel a connection with them. 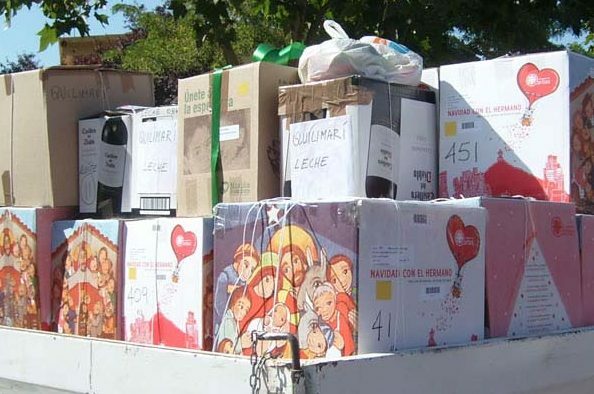 This year, the boxes will be going to three families in Mary Queen of Peace Parish in Cerro Navia, one of the most densely populated and poor communities in Santiago. Griffin and Cornejo were among thousands participating in the “Christmas With Brothers” campaign run by the Archdiocese of Santiago, which means that more than 13,000 families in need with receive a Christmas box with all the ingredients needed for Christmas dinner. The boxes often contain personalized messages to the families that are receiving them and a prayer. The initiative, which has been running for the last 20 years, has become a Santiago tradition. Planning begins in September, when an archdiocesan team visits parishes across the city. Churchgoers, schools, colleges and companies are encouraged to join the campaign. Once they have registered, they can visit centers in their local parish and buy a box for around $8 dollars, which already includes a chicken. They take the box away and fill it up with ingredients for a Christmas dinner. Rice, peanuts, Christmas cake, fizzy drinks, tinned fruit and vegetables are some of the favorites that people purchase for the boxes. Sometimes they even include Cola de Mono, a traditional Christmas drink that includes alcohol, milk, coffee and cloves. Once the boxes are ready they are then returned to the centers, ready for distribution. “We put the boxes together with our two daughters,” said Griffin. “We’ve been doing it for the last three years, and it is something which has become really important to us. As well as the food we also try and find a personalized present for everyone in the family. For us this is all about the spirit of Christmas. We want them to have a dinner filled with love. We also want them to feel that we care about them and that they are close to God at this important time of year, when all of us celebrate the birth of Christ. The boxes go to families that are chosen by parish volunteers. They might be people who are out of work and struggling to find a job or people with sickness in their family. 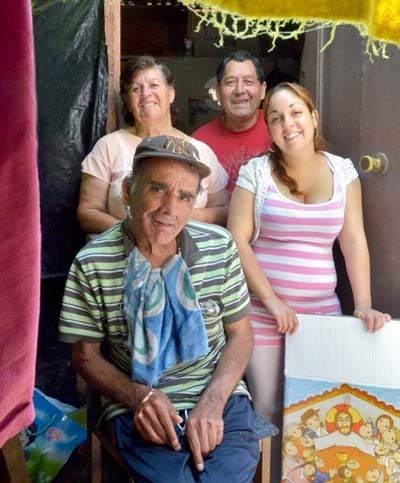 This year, Elba Diaz, who lives in the Parish of St. Thomas in a poor area of Santiago, will receive a box. Her family includes her husband and two sons, one of whom is ill in the hospital, and her older brother, who is disabled. They all celebrate their Christmas dinner together Dec. 24 and are very grateful for the Christmas boxes which they have been getting for the last six years. “The boxes have been such a blessing for us and thanks to God we have never gone without; it’s a great help to be able to get food from the box to make our Christmas dinner. We share everything,” said Diaz. Ana Luisa Munoz, who works in the archdiocesan pastoral care office, which coordinates the campaign, said helping others is what the campaign is all about. “To be able to give someone else the ability to have a proper Christmas dinner is a gift from one family to another, which joins us together as a Christian community. It’s about getting the message across that they are not alone,” she said.